Patients must be the first criteria in the final decision on the European Medicines Agency (EMA) new location, as claims the report launched by Fundación de Ciencias del Medicamento y Productos Sanitarios (FUNDAMED). Besides from the specific criteria established by the European Comission (EC), Fundamed is interested in analyze those criteria that will influence the patient’s safe and timely access to the most advances treatments and medicines. Among all the criteria to be taken into account, staff retention is a key factor, since this guarantees both, the business continuity and patients’ rights. Depending of the extent of the specific staff loss, there are certain public health issues, such as the initiatives against antimicrobial resistances, which may be endangered by an irresponsible decision. In this way the EMA itself has highlighted 5 main candidates for its relocation. However, there are significant differences among them, so that only 3 candidates can guarantee the performance of EMA activities: Barcelona, Amsterdam and Milan. 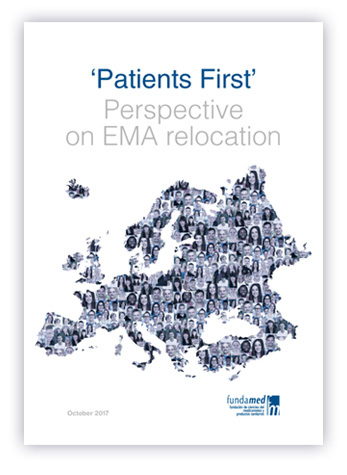 The aim of Fundamed report is consider the patients needs, because patients should be the main concern in the EMA relocation decision. For this purpose Fundamed has prioritized the criteria that will affect them the most and the report reinforce the patients’ interest. The Patients First report is focused in a quali-quantitative analysis of those criteria that put the patient’s safety and access to medicines in the spotlight. Thus, the criteria analyzed from a Patients First perspective are: 1) Business Continuity; 2) Building and infrastructure and 3) Location and accessibility. From a Patients First focus, criteria should give a high weigh to candidates that guarantee that citizens are the real benefited from the continuity of the EMA activity. For Fundamed, the results of the analysis show that only 3 of the candidates’ cities are in excellent conditions to assume the EMA work on time to avoid irreversible consequences, those are: Barcelona, Amsterdam and Milan. 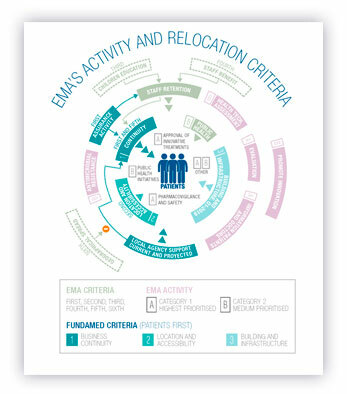 The final decision on EMA headquarters will be adopted on 20 November when Member States will vote. This decision must be informed and must assume all the risks and consequences for the European patients.